Designed keeping in mind your comfort and convenience, Mahindra Rodeo is a scooter which also has a good pick up and enlivening power. Its trendy and stylish look makes it a unisex scooter. It can be the best for youngsters who wish to drive a capable scooter. The preferences of modern buyers are kept in mind and, therefore, it is available in seven backlight colours. One of the best parts is the mobile phone charger is available in the scooter. This version of scooter has a better ground clearance than many other scooters of this type and style. Pillion seat, grab rail and footrest make the ride convenient for its customers. The seat of the scooter is placed a little lower which makes it quite comfortable for the rider. The fuel indicator is digital and along with it there is a low fuel warning lamp in the scooter. This scooter has compact dimensions that measure 1790 mm in length, 690 mm in width, and is 1110 mm high. Body coloured mirror is making it more stylish. Being designed as an everyday scooter, it has a 4 stroke engine and it is air cooled. It is a good scooter to ride in the city with traffic in everyday life with the top speed of 80 kmph. 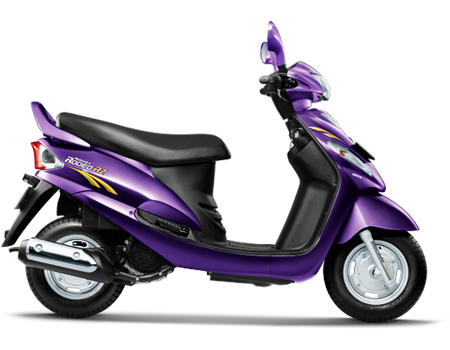 The scooter has the new and advanced 125cc Z-Series which gives it superb power and pick-up. Both front and rear tyres are equipped with drum brakes, 130 mm each, which make its breaking very efficient for traffic. The scooter has a simple braking system which makes it prone to accidents. Therefore taking a comprehensive insurance policy will be a good decision.